Yesss! Anime Expo 2013 schedule is now available in the Guidebook app! By the way pre-reg is still open, and unless you like standing in Xbox huge lines for over 9,000 hours, is highly recommended. And if you STILL haven’t made your hotel reservations (you damn slackers!) then you better hurry – vacancies are still available at the Sheraton LA Downtown and Millennium Biltmore, but they won’t be for long! 2 comments to Yesss! 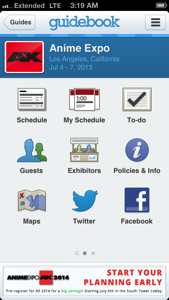 Anime Expo 2013 schedule is now available in the Guidebook app!